We have had some passing thunder storms this week. We defiantly need all the rain we can get. If you are on the water when the rain comes, it could put an end to the spinner fall for that morning. Sometimes the Trico spinners will get washed in to the water other times they seem to just disappear. Either way the feeding activity will not last long, unless there are a lot of bugs on the water to start with. The rain that we got so far will not cause any increase in water flows for now. We need a lot more ran than we have gotten to do that. So far all the fly patterns have stayed the same. Size 20 Trico, ants in size 16 to 18 or beetles in sizes 16 to 12, are still doing the job. Tip: Fishing to spooky trout. As I have said many times, we have been picking on these trout for over three months now, they know the game. We have to be on top of our game. Becomes the flies are small, trout will often hang just under the water surface while they feed. When trout feed like this, they can be very sensitive to any type of disturbance. This means sloppy wading, bad casting even normal mending of the line will send the trout running. We need to change our thinking when we get to the stream. We now are stalking the trout. The wading part is self explanatory. But when it comes to casting the fly to the fish, this is where most of us lose it. Most of us have a tendency to cast the fly to far up stream. By the time the fly gets to the fish the current has caught hold of the fly and the fly is being pulled across the water surface. We normally solve this problem by mending the line. The issue with this is that the trout are feeding just under the surface, and will be easily spooked by mending the line. Compensating for this is straight foreword, just cast the fly closer to the fish about one foot from the feeding fish. You will not upset fish that are actively feeding just under the water surface. They will not notice the fly landing on the water. You will get the best part of the drift as the fly goes over the fish. When the current catches the fly, the fly will be behind the fish. Safely swinging away from the fish. It has been some time since my last update. 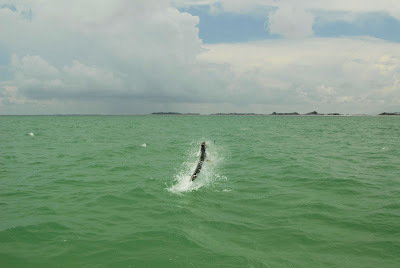 I have been out fishing, went to Florida to do some tarpon fishing. As you can imagine the weather was hot, but the tarpon were on the fly. 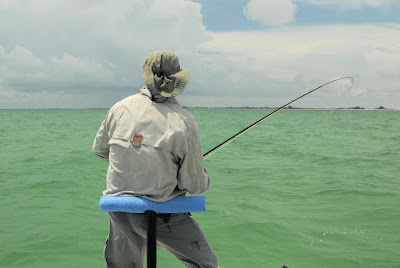 Make a good cast and a good presentation and the tarpon would eat the fly. There is nothing easy about tarpon fishing. The fish are fussy about the fly. Once they eat the fly, the tarpon has a boney mouth. It is hard to set the hook. The fish are big. They will put up a monstrous fight, making a 12 weight fly rod feel like a light weight. There is not much that can compare to sight fishing to a fish that is 4 to 6 feet long. I am back home and back to fishing for trout. The Trico are on and the trout are feeding on the bugs. This is going to be some of the best dry fly fishing we are going to have this season. Water flows are on the low side, but good for this time of the year. For the trout to feed efficiently, the water flows need to be on the low side. Keep in mind, with the water flows and the fact that we have been fishing for this trout for about three months they are spooky, they know the game. Light rods, careful wading and fine leaders are the name for the game for us. For now the tricos are a size 20, most of the time we should be able to get away with this size. When the fish get fussy we may need to go with a size 22. But most of the time we can get away with the size 20. I have found that when the trout are not taking the tricos, I go to an ant in size 16 to a 18 or beetles in sizes 16 to 12. These flies will work later in the day if the wind the air temperatures increase. We need warm air to get the bugs moving and the wind to knock them in the water. Spring brook is still fishing as always. Normally we would be having trouble with weeds. But this is where the geese have come in handy. They have kept the watercress, eating out of the way. There is no weed in the way and there are some really nice fish hanging around. May flies are done hatching for the year, but midges and scuds are what is on the menu for the trout. This time of the year the trout will feed heavy for a day of two and then be off the feed for a day. So you have to go and see if it is happening or not. Stay with size 16 or 14 scuds and midge patterns size 20 and smaller, some days you cannot use small enough midges. We are still offering our hatch special. We will be fishing the morning trico hatch. Meeting somewhere between 6 and 7 am and fishing through the hatch, ending somewhere late morning, noon. If interested call the fly shop at 585-352-4775 or you can call my cell at 585-233-0436. The dog days of summer are here. The main hatches of spring are over. The even spinner falls are now become inconsistent and light. We are now fishing the morning shift. The streams and rivers are now benefiting from all the wet weather we had in the spring. Most of our streams have a good flow of water for now, despite how dry it has been. True to form for this time for the year, we need rain. Water tempers have not been a big concern, in till now. Most of the trout streams have benefited from strong flows from ground water. Most of the summer hatches, come off early during the early morning hours. This is normal for the summer hatches. For now we are seeing some olives size 22 to 24. The Trico hatch will get going with in the coming week. Hear to this a size 20 fly. This is technical fishing long litters and light tippets. Also keep in mind that we have been picking in these fish for a few months now. They know the game, wade slowly and do not hit the water with the cast. Most of the summer bugs are small with the expectation of the Isonychia, this is a size 10 fly. Keep in mind that this fly dose not hatch in big numbers or is present on all of our trout waters. However where these flies do exist they are an excellent fish getter. Along with thefor mentioned flies, it is time for ants and beetles. These are a good choice for mid to late morning when the sun gets on the trees. If the evenings are your time to fish, then stay with rusty spinier in size 18 to 20 white wolves size 14. You may want to try fishing brown and olive wilily buggers in size10. The bigger trout will be feeding in crayfish instead of all the small bugs.